Hi, this is Temba calling from Kathmandu. 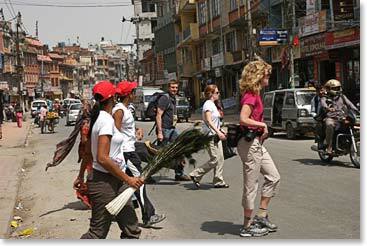 Today we did a sightseeing tour around Kathmandu which has a culture very rich in history. We started early this morning when we left the Yak and Yeti for Swaymbhunath, the “Monkey Temple”, above Kathmandu. There we saw Buddhists walking around the temple in a clockwise direction spinning their prayer wheels. We visited the Pashupati, Kathmandu's most famous Hindu holy place where we hung out with some pretty colorful holy men. We also went to Boudhanath, also a World Heritage Site, and an important place of pilgrimage for the Buddhists.. Everybody had a very enjoyable day. We have a very early morning flight to Lukla. We'll be in touch again tomorrow. Bye now! 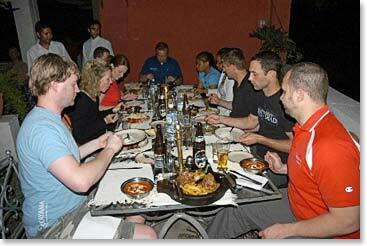 The team enjoying their first dinner together. Exploring the historic streets of Kathmandu. Theresa, LaQuishia, LaShonda and Paul Mistor on today's sightseeing tour.